Opaque dark purple color. Deep, pure, dark aromas: cassis, blackberry and plum. Intensely floral with savory complexity: sage, pine needle, cedar and sweet tobacco. Beautifully integrated wine, layered and textured with a long sleek flavor delivery along the entire arc of the palate. Ripe blue and black fruits, building density, sweet chewy tannins with mineral freshness on the lively supple finish. Lingering licorice, floral gravelly lift. Demonstrating the gorgeous purity that is the hallmark of this elegant vintage, our 2014 Napa Cabernet fits perfectly into the DuMOL stylistic playbook. It’s a blend of two special vineyards that complement each other effortlessly. 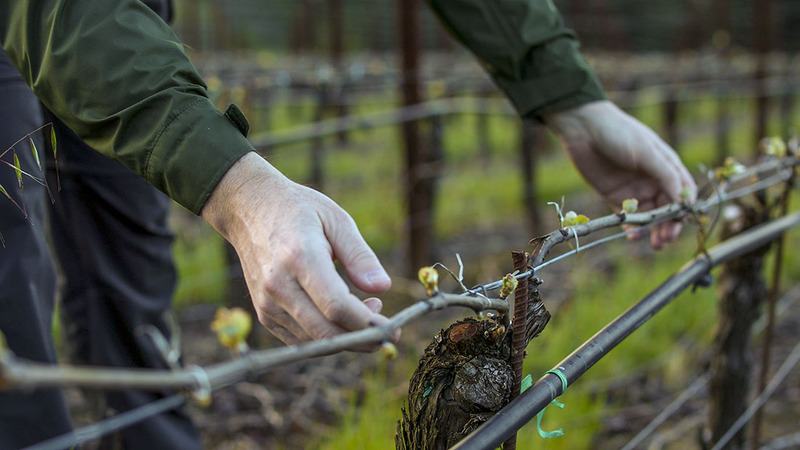 Ballard, planted in iron-rich red volcanic soils at 1,800 feet atop Spring Mountain, is dense and chewy with complex earth and herb aromas, dark black fruits and prominent structure. Rewa, planted on shallow rocky white volcanic ash in the cool Coombsville district, is exotically floral, richly textured with layered suppleness. A beautifully seamless combination. The wine is lavishly aromatic – simultaneously exotic and complex – and these characters never fade, even after three days from a partial bottle. The wine’s weight and density build gradually as it opens in the glass so that rich layers of blackberry jam fruit take hold and absorb the wine’s solid structure. But at all times the wine retains its cool climate mineral streak – dark, fresh and lively with pinpoint focus and livewire intensity. Really delicious. The wine is lavishly aromatic – simultaneously exotic and complex – and these characters never fade, even after three days from a partial bottle. The wine’s weight and density build gradually as it opens in the glass so that rich layers of blackberry jam fruit take hold and absorb the wine’s solid structure. But at all times the wine retains its cool climate mineral streak – dark, fresh and lively with pinpoint focus and livewire intensity. Really delicious. You can age this for 10+ years and it will continue to put on weight in the bottle, but the nature of the vintage is upfront pleasure, so no need to wait and don’t be afraid to drink on release.